On July 10th, 2013 Alicen Schneider and I were given a private tour of Abbey Road Studios in London. Our guide was Colette Barber. Here are some photos I took inside this legendary recording studio. Abbey Road Studio One can facilitate a 110 piece orchestra. In this room John Williams recorded the soundtrack for Return of the Jedi and The Empire Strikes Back. Also the Beatles famous live video for "All You Need is Love" was done here. 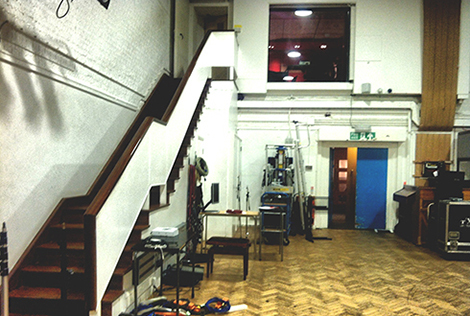 This is Abbey Road Studio Two. 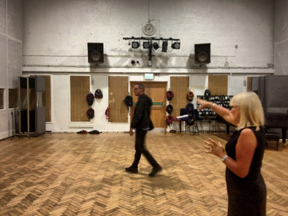 More than 190 Beatles songs were recorded in this room. This piano, which was pushed into a corner of Studio Two, was used to record the Beatles' "A Day In The Life." This is Lester Smith, Abbey Road's tech and microphone guy for 42 years. Here he's showing me a blumlein microphone from the 1930s. This is one of the Neumann U47 microphones used to record Lennon and McCartney vocals. Lester Smith manages and maintains over 600 vintage and modern microphones for the studio.